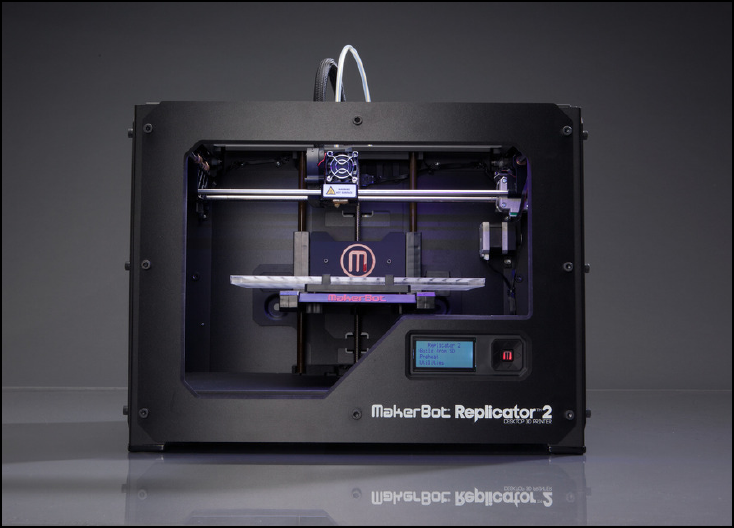 MakerBot 3D printers use Fused Deposition Modeling (FDM) technology. The MakerBot uses ABS or PLA plastic filament, which extrudes through a heated nozzle to print the part layer by layer. The MakerBot works with Mac, Windows, and Linux. There is a free download of MakerWare software that the printer requires to convert STL files for printing. The MakerBot prints at a resolution of 100 microns. First, the user creates a 3D model in a 3D modeling program and saves it as an STL file. The file is sent to MakerWare, the printer’s interfacing software, where it slices the model into sections and determines how the layers will be printed. Once the model is sent to the printer, the plastic filament extrudes through a heated nozzle layer by layer until the part is complete. MakerBot Industries was founded by Bre Pettis, Adam Mayer, and Zach Smith in 2009. The founders use RepRap open-source software as a foundation for the MakerBot. The company is headquartered in Brooklyn, New York. MakerBot’s sister site, Thingiverse, offers free 3D software downloads and users can upload their 3D designs to share as open-source designs. In June of 2013, MakerBot was acquired by Stratasys, Ltd. for $403 million dollars. This merger gave Stratasys a foothold in the desktop 3D printing market and MakerBot the financial backing to compete and grow.